HOUSTON (CN) – Texas urged a federal judge Wednesday to shut down the Deferred Action for Childhood Arrivals program, claiming it costs the state more than $250 million a year. The hearing comes just 15 days before another judge’s order is set to take effect that would force the government to resume accepting new DACA applications. No group of immigrants embodies the United States’ ambivalence toward illegal immigration more than the roughly 700,000 who received a reprieve from deportation under DACA, a policy President Barack Obama’s administration enacted in 2012. Public opinion polls show that most Americans believe the immigrants, the majority of whom were brought to the United States illegally as small children by their parents, should be allowed to stay in the country and obtain citizenship. Texas Attorney General Ken Paxton disagrees. He is leading a coalition of Republican-controlled states who filed a federal lawsuit on May 1 seeking to end DACA. Paxton could not have chosen a better judge to preside over his case. U.S. District Judge Andrew Hanen in 2015 blocked the Obama administration from expanding DACA, and he stopped it from implementing a sister program, Deferred Action for Parents of Americans and Lawful Permanent Residents (DAPA), which would have made about 3.7 million people eligible to apply for protection from deportation. But Hanen showed no favoritism on Wednesday. With 50 people sitting shoulder-to-shoulder in the gallery, Hanen kicked off proceedings with a conciliatory statement. “No one in this case is a bad guy. The states are trying to do what’s in their best interests, the government is trying to develop good immigration policy and the interveners are 22 people trying to live the best lives they can,” he said. Twenty-two DACA grantees, represented by the Mexican American Legal Defense and Educational Fund, and the State of New Jersey, have intervened in the case to try to save the program. The case is unusual in that the federal government – the defendant – agrees with the plaintiff states’ claim that the Obama administration shouldn’t have started DACA because only Congress has authority to make sweeping changes to immigration policy. MALDEF and New Jersey state attorneys urged Hanen to dismiss the case. They argued that Texas lacks standing because both Texas and the federal government want DACA to end. But Hanen noted that even if the government wants to shut down DACA, it cannot because federal judges in San Francisco, Brooklyn and Washington, D.C., have barred the Trump administration from phasing out the program. U.S. District Judge John Bates on Friday ordered the government to start accepting new DACA applications, but stayed the order until August 23. With Paxton sitting at the plaintiffs’ table behind him, Texas Assistant Attorney General Todd Disher argued that Texas has standing because the DACA grantees in the state – which number more than 100,000 – cost it more than $250 million a year in education, health care and law enforcement costs. 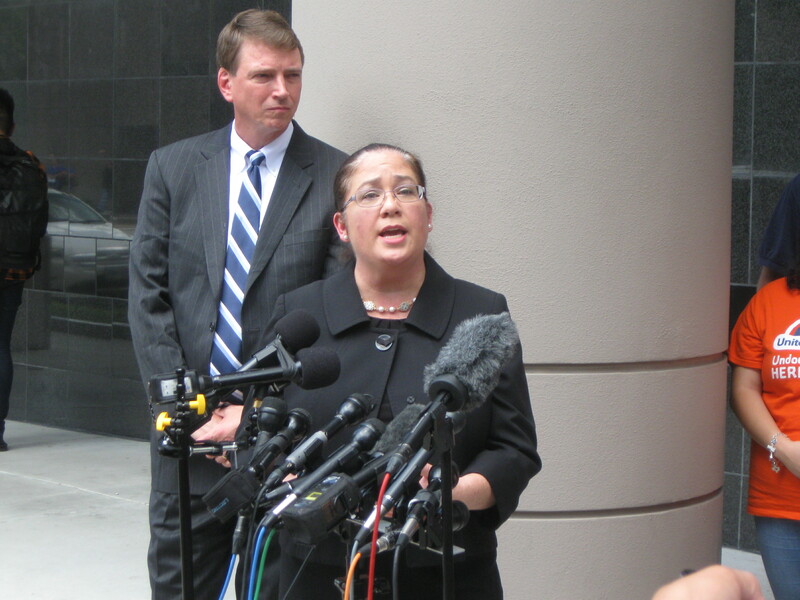 But MALDEF attorney Nina Perales questioned what Texas stands to gain. She said there’s no evidence that DACA grantees would leave if the program ended. “They would do everything in their power to stay,” Perales said. She said it would cost Texas more to pay for safety net services for DACA recipients if they lose their status because then they would also lose their jobs. She admitted, however, that because DACA grantees must apply to renew their status every two years, the government has their info on file and could deport them. Hanen told Texas the timing of its lawsuit, filed six years after DACA took effect, undermines its petition for a preliminary injunction, which requires a plaintiff to show they are likely to succeed in the case. “Some courts have ruled that delay in and of itself discredits likelihood of success. How do we get around that?” Hanen asked. Disher said Texas decided to file suit only after Bates issued an order in April blocking the Trump administration from rescinding the program. One of the government’s main claims is that DACA is illegal for the same reasons courts blocked DAPA. Hanen and the Fifth Circuit found that the Obama administration violated the Administrative Procedure Act in trying to implement DAPA because it was a substantive rule, not just a policy change. As such, it required a notice-and-comment period allowing the public to weigh in before it was enacted. Both the Fifth Circuit and Hanen found that to qualify as a policy statement, DAPA had to give immigration agents the right to exercise discretion on whether to accept applications. But they said DACA revealed that case-by-case review was a farce, as evidence showed that at the time only 5 percent had been evaluated. They determined that DAPA applications would be similarly approved without meaningful review. Disher said that out of 760,000 DACA applications reviewed for the new case by a U.S. Citizenship and Immigration Services center in Texas, it could not find one qualifying application that an immigration agent denied at his or her discretion. But Perales said the U.S. Supreme Court, in its June order upholding the Trump administration’s ban on granting visas to residents of several Muslim-majority countries, rejected the need for a case-by-case evaluation for discretionary acts. New Jersey Assistant Attorney General Rachel Apter added that it is clear USCIS does not just rubberstamp DACA applications because it rejected 22 percent of them in 2015. He gave the parties five days to answer that question. Teacher Daniel Candelaria, an organizer for the Houston branch of DACA-advocacy group United We Dream, spoke to reporters after the hearing. 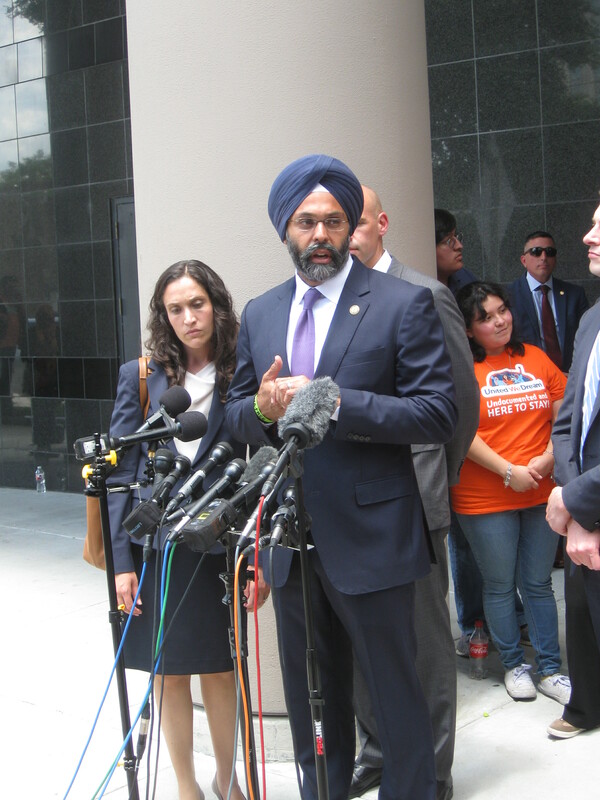 New Jersey Attorney General Gurbir Grewal speaks outside the courthouse after the hearing. New Jersey Attorney General Gurbir Grewal, the nation’s first ever Sikh-American attorney general, also spoke outside the courthouse after the three-hour hearing. He said Texas did nothing for six years as hundreds of thousands of people enrolled in DACA. “Then suddenly, four months ago, Texas decided the DACA program somehow violated the rule of law,” he said. Paxton did not address reporters after the hearing.